This essential oil carrying case is custom designed to hold 32 (thirty two) 5ml or 15ml bottles. The elastic strips that securely hold the bottles are positioned so that each label is clearly visible, making it easy to find the oil you choose. 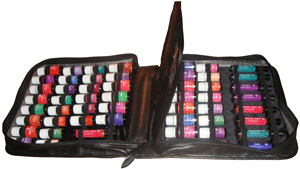 This essential oil carrying case is custom designed to hold 64 (sixty four) 5ml or 15ml bottles. The elastic strips that securely hold the bottles are positioned so that each label is clearly visible, making it easy to find the oil you choose. 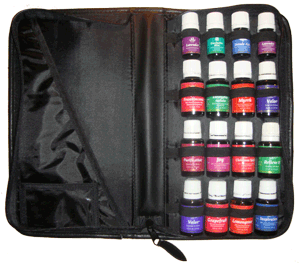 This essential oil carrying case is custom designed to hold 16 (sixteen) 5ml or 15ml bottles. The elastic strips that securely hold the bottles are positioned so that each label is clearly visible, making it easy to find the oil you choose. 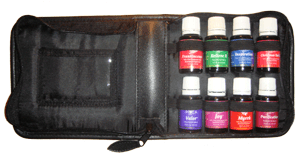 This essential oil carrying case is custom designed to hold 8 (eight) 5ml or 15ml bottles. The elastic strips that securely hold the bottles are positioned so that each label is clearly visible, making it easy to find the oil you choose. We only recommend using Young Living Essential Oils because of their superior quality, therapeutic properties, and strong laboratory testing on each essential oil. Here are some essential oil carrying cases custom designed for Young Living's 5ml and 15ml size bottles. These carrying cases can also accommodate Young Living's Roll-On essential oils. 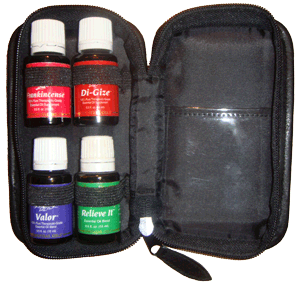 This essential oil carrying case is custom designed to hold 4 (four) 5ml or 15ml bottles. The elastic strips that securely hold the bottles are positioned so that each label is clearly visible, making it easy to find the oil you choose.